In order to fulfill the diverse needs of our clients, we are manufacturing and supplying a qualitative array of Rider Helmet. • Worn by drivers of motorcycle or other two-wheeler. • Lightweight • Optimum strength • Durability. 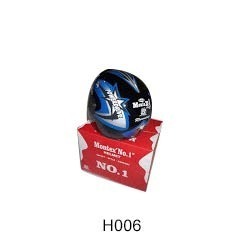 Established in the year 2006, Pooja Enterprises is one of the eminent names of the industry thoroughly engrossed in manufacturing and wholesaling a broad gamut of products which comprise Safety Helmet, Glass Helmets, Riding Helmet, Airframe Construct Helmet, Sporty Helmets, Two Wheeler Helmets, Covered Helmets,ISI approved helmet and many more. Developed making use of top class basic components along with modernized tools, these offered products present utmost level of safety to its users. Not only this, the complete range is examined thoroughly prior getting delivered at the end of our customers. Available in a range of sizes and designs, these are broadly acknowledged.